If you love relaxed rural retreats and modern low-key living, then this timber barn is definitely for you! 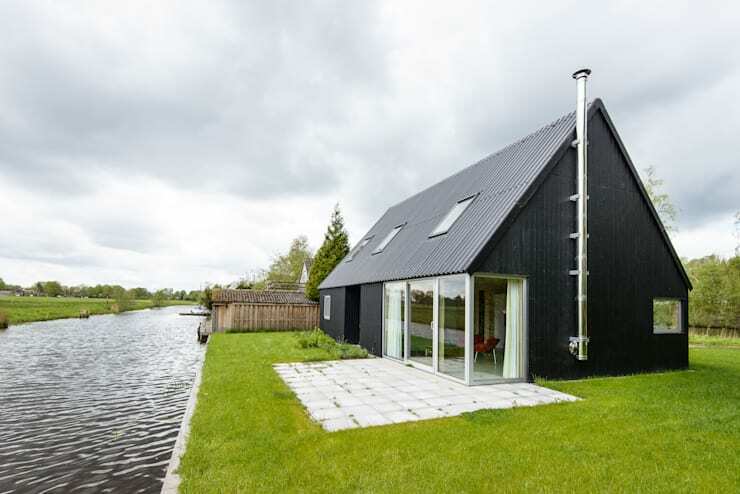 It is located by the bank of a small river in the Dutch countryside and presents a lovely wooden barn-like facade. But it's also a home built for contemporary living. The steep-sloping peaked roof has been used to create a spatial interior with lots of high, bright open spaces and a free flow of light and life. Generous windows permeate throughout the house in interesting forms and configurations. These invite lots of light into the space and pale wooden walls accentuate the bright illuminated feel. At the same time, Kwist Architects have installed some very unique mirrored skylights that take this to another level. Light is clearly important in this home. But before we give too much away, come with us on a photo tour to explore more! The architects were tasked with creating a simple summer home with modern convenience. 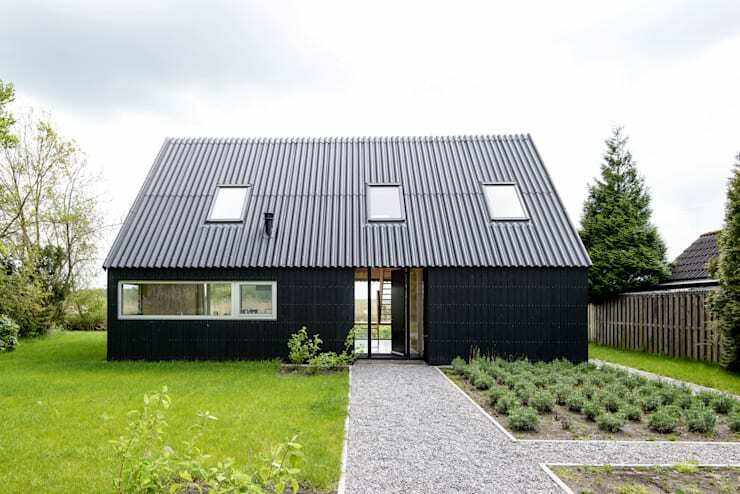 Here we can see the classic countryside exterior with striking black timber panels and a steep-sloping peaked roof. 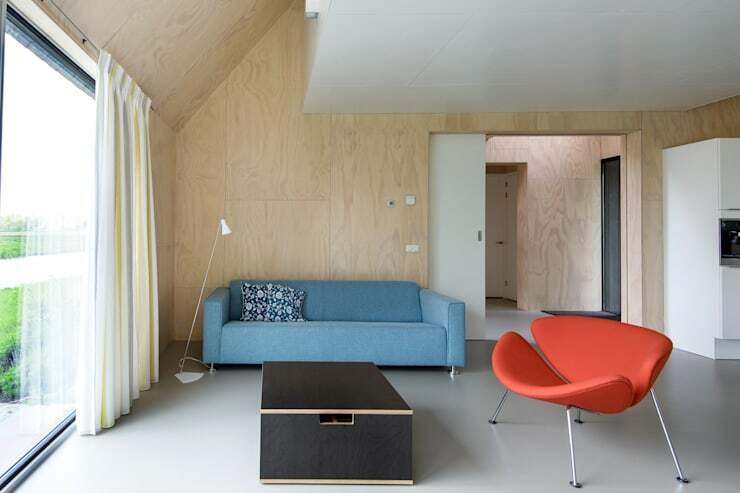 The home would not be out of place in the traditional Dutch countryside, and yet, as we will discover, it offers a bright, contemporary feel. The rear exterior presents a better insight into the careful balance of tradition and innovation in this design. A series of floor to ceiling sliding doors have been created to take full advantage of the peaceful, riverside setting. The outdoor area is very minimally designed for unobstructed views of the river. This also serves a dual purpose. This home is only to be used part of the year and it was important to create a low-maintenance design. Rustic elements are a big part of the country look. But as we can see in this living room, they can be integrated in a very subtle way. 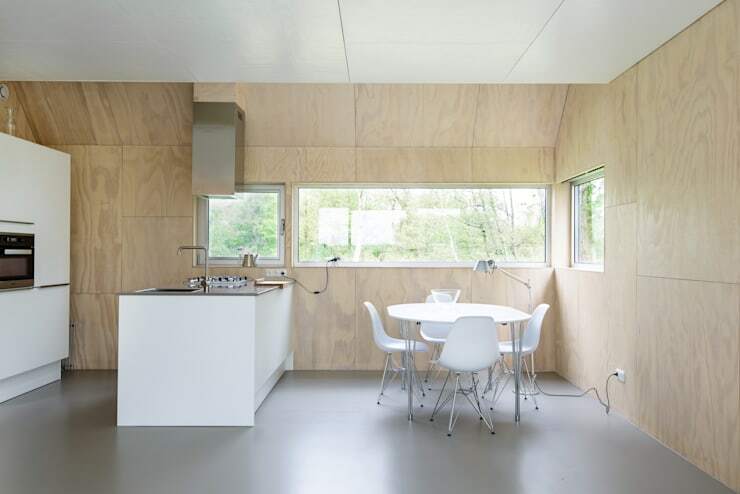 The pale plywood walls and unfussy design make the living room and other interior spaces feel very low-maintenance and easy. A simple serene grey floor amplifies the effect. Finally, a collection of vibrant and eclectic living room furnishings complete the summery feel. Summer living is all about socialising with others and enjoying the simple things in life. Accordingly, the white wooden kitchen has a minimalist decor. A compact kitchen design with an outward facing bench provides easy efficiency. At the same time, a horizontal band of windows invites the occupants to enjoy the natural surrounding views. They also soak up the natural light that is so precious in a Northern European climate. As we move back through the living room, we come to the staircase. The entire interior has a magical, serene feel, but here we can see how cleverly the staircase design plays a role in this effect. 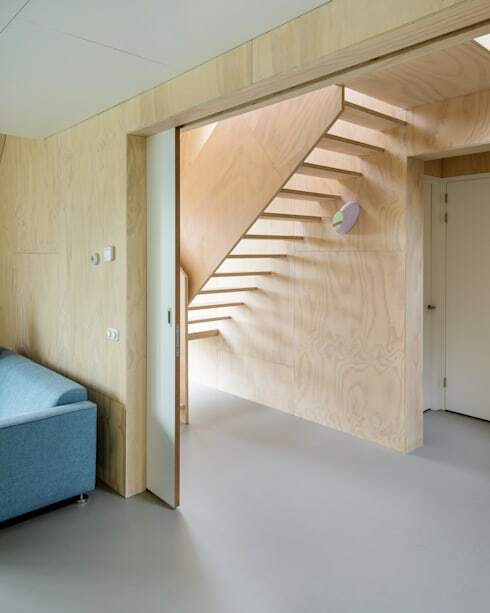 The minimalist wooden staircase has been created so as to allow light to flow freely from the front door through the hallway. It's a simple decision, but it's an important one. Finally, we come to our favourite feature in the house—the skylights! Here we get a glimpse of the unusual mirrors strategically placed to reflect the natural light. The mirrors are darkly burnished and subtle, but they have a very powerful effect on the home. All in all this house is a wonderful example of a simple, practical modern home. If you're interested in bright timber homes, you'll love A Minimalist Bungalow Bathed in Light—it's an absolute sensation! 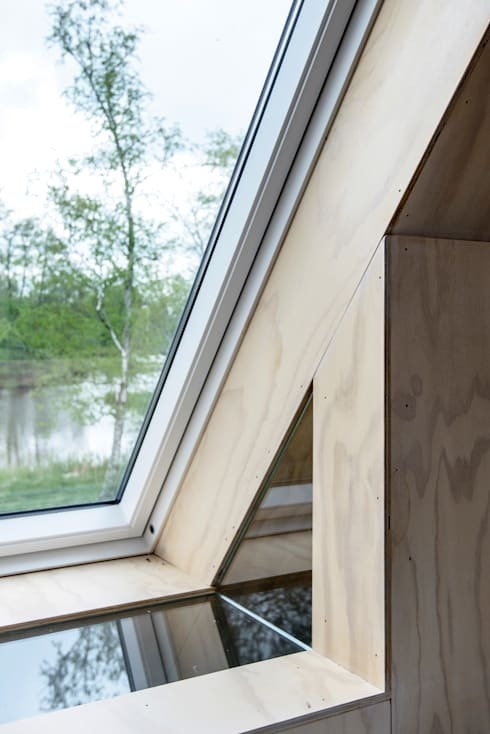 What do you think of the unique skylight in this timber home? Can you imagine living here? Let us know in the comments!